I have an array of devices which depending on operating condidion may run hot or not. I will have an NTC sensor for each, but I'm not concerned about sensing them individually, whichever runs the hottest will be used as feedback for thermal throttling and fan speed. Most likley case say 15 out of 16 will be close to room temperature and one is running hot and I want that temperature to control my system. Planed operating range is 0-60 degrees, nominal is 20 degrees, warning/fan increase at say 40, thermal throttling at 50 and trip the system at 60. In the off chance that say 10 of 16 is running at 39 degrees but due to some summing effect the system sees 45 and runs the fan unessesarily high, that's ok. Accuracy is not that important, but it can't be a straight sum of temperatures either. What methods are there to cheat on this? Cost is a factor so no 1-Wire digital sensors and MCUs. 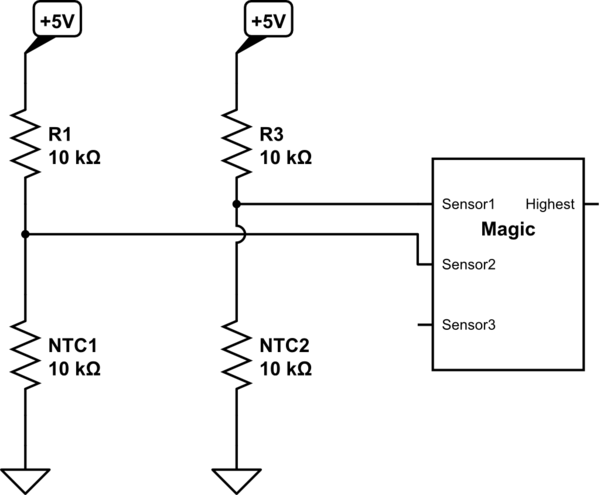 Bias each NTC individually and OR them with diodes and apply some compensation factor? Is there a standard solution for this problem I can't seem to find? My google-fu is usually good, but this week it's not working for me. whichever runs the hottest will be used as feedback for thermal throttling and fan speed. If you want an analogue solution use a precision rectifier circuit for each channel and tie all the outputs together. The NTC sensor that produces the highest voltage output will win the battle to imprint its voltage on the common output line. All other sensors will lose the battle and not affect the common output line. Whichever input is most positive will superimpose itself at Vout. How do you remove the buzzer from this PCB whose solder side is inaccessible? How do I use the measurements from the datasheet to create a footprint? 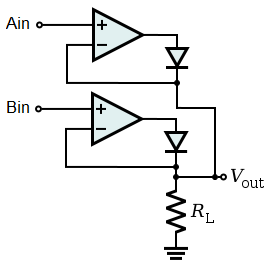 How to determine the electrolytic capacitor polarity from PCB printings? I am converting my project from Arduino uno to a PCB to reduce the size and wanted to know if the i2c channel will still be accessible? How do I remove this Coating from the PCB? Calculating the excact size of a PCB from a photo?